Ghosts walking the streets of Dan Sai during Phi Ta Khon. "Phi" is Thai for ghost and "khon" means mask. So technically they're ghosts with masks. 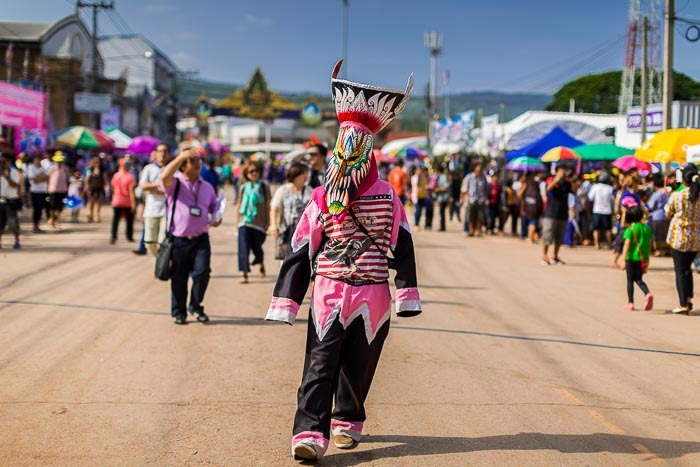 I went up to Dan Sai with Gavin Gough to photograph the annual Phi Ta Khon, or ghost festival. 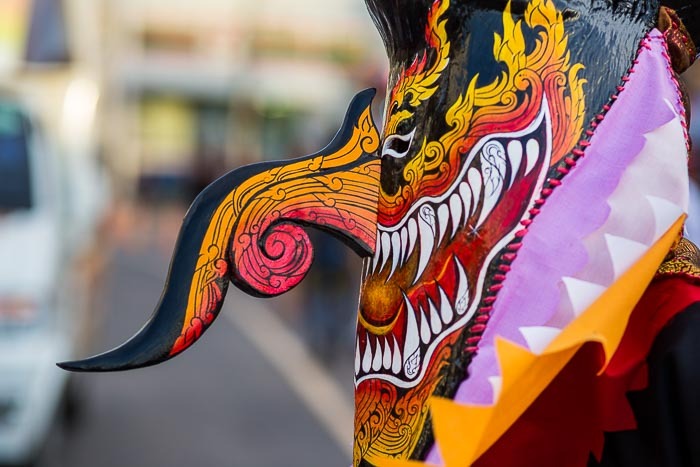 Like the Wat Bang Phra tattoo festival, it's one of the uniquely Thai celebrations of the supernatural. The Ghost Festival has its roots in Buddhism. According to the legend, Vessantara Jataka, a prince in one of the Buddha's past lives, was thought to have died during a long journey. When he returned from the journey alive, a party was thrown in his honor. It was so loud it woke the ghosts in the forest. To honor the spirit of Prince's return, locals dress as ghosts and come into town. A "ghost" strolls through Dan Sai. These are not Casper like ghosts though. No low profile simple white bedsheet with eyeholes. 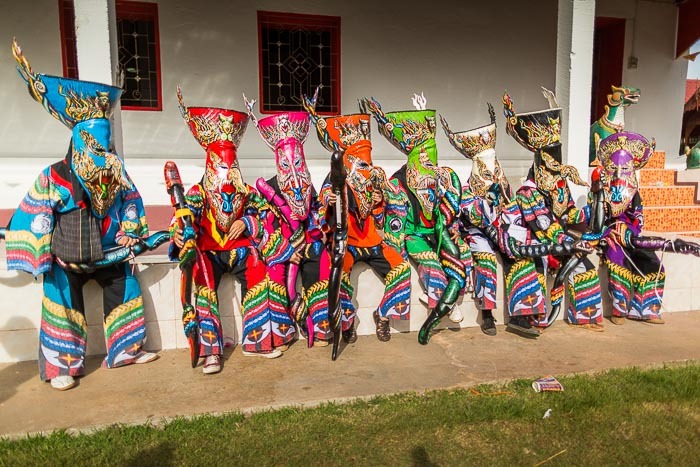 These are high profile ornate outfits with intricate masks that virtually scream, "Check me out!" The ghosts walk through town drinking the local rice wine and whiskey and poking people with large phallic sticks. A Phi Ta Khon mask. The crowd favorites are probably the mud men. A group of men, fueled up on rice whiskey, cover themselves in mud from the Mun River (which runs through Dan Sai) and shuffle through town. 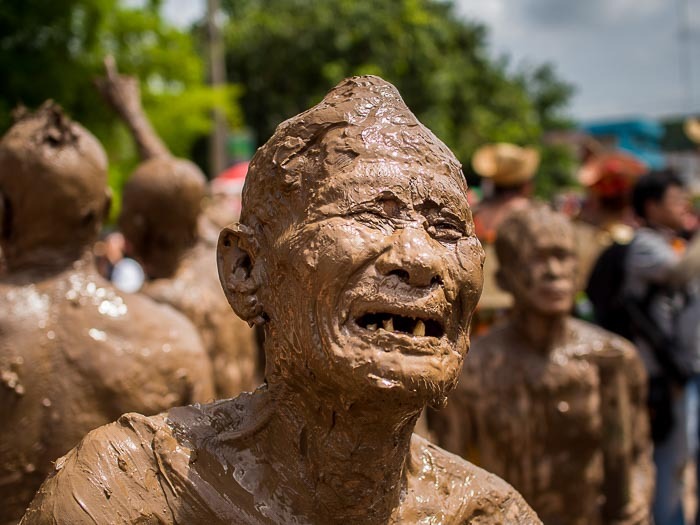 The mud men channel the town's guardian spirit, Phra U-pakut, who lives in the river. 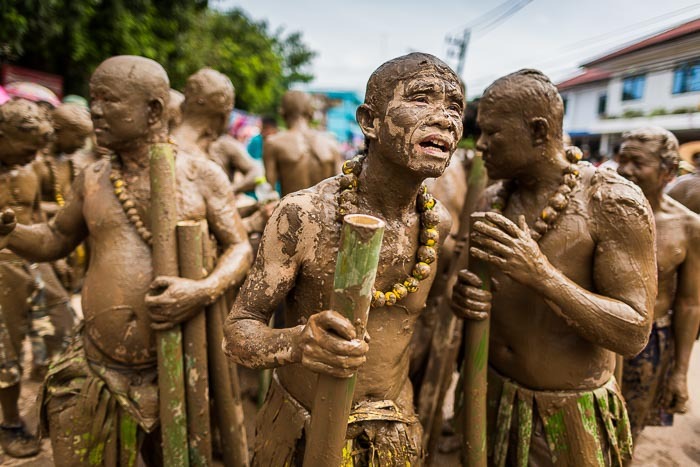 Mud men shuffle through Dan Sai. If ghosts aren't your thing there's still plenty to do at the festival. It has become big business. 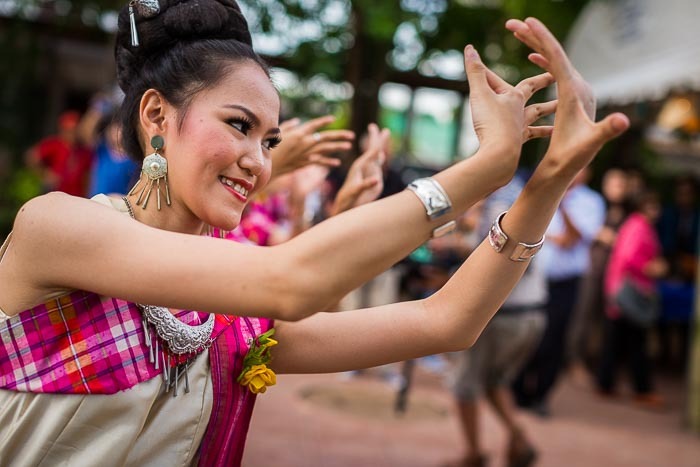 There are stages with entertainment and cultural shows and a market of local crafts and artisan products. And of course there's food. Lots and lots of food, most of it fiery Isan style food. One of the cultural shows at the Phi Ta Khon. The second day of the festival ends with a rocket launching party. People gather near a bamboo scaffolding in the temple cemetery and watch as folks launch large (6 - 10 feet long) rockets into the sky. 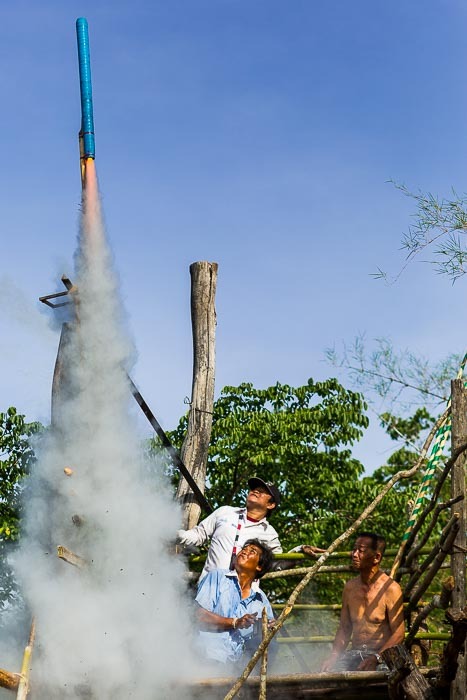 The rocket launches are a Thai Isan tradition to ensure a good rainy season. Lift off! A homemade rocket blasts into the sky. The festival is officially three days but the first two days are the best for visitors. That's when the ghosts and other colorful characters come into town for a raucous good time. The last day is reserved for merit making at the local temple and is much more low key. Ghosts sit on the porch of the local temple towards the end of the ghostly part of the festival. 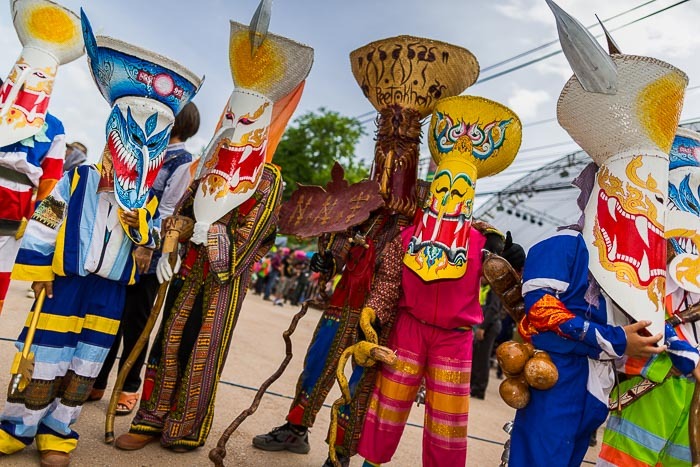 There are more photos of the Phi Ta Khon in my archive or available from ZUMA Press.